In the post-nuclear apocalyptic future in 199X, the human race has regressed. Weak villagers are reduced to slavery, while genetically enhanced giants rule the world. Gunpowder seems only a distant memory, and the martial arts is the only weapon a man can count on. Two schools face one another in the battle for dominion: Hokuto Shinken and Nanto Seiken. 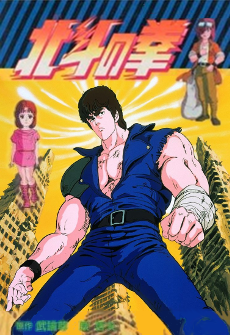 The series begins when the Hokuto successor, Kenshiro, travels the desert to confront Shin, a member of the Nanto Roku Seiken, their six ruling stars, who has taken his fiancee Yulia. Episode 2 - The Fist of Lingering Regret and Certain Death!! The Future is Sighted in the Barren Wasteland!! One of the original shounen shows. An absolute must watch martial arts romp that might change your life.